Rocky Mountain Chocolate Factory has a Rice Crispy Treat they call Avalanche Bark. If you haven't tried it they are AMAZING!!! 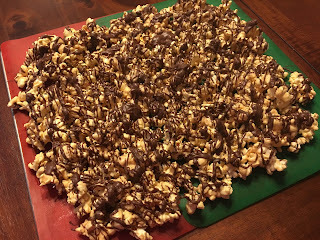 Their Website describes them as a mixture of creamy peanut butter, white confection, crisp rice cereal, chewy mini-marshmallows and topped with semi-sweet chocolate chips. It's crunchy, chewy, chocolatey and sweet!